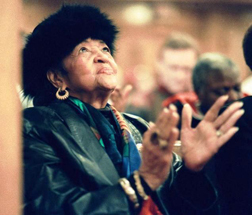 GREENVILLE, S.C. – Helen Burns Jackson, the mother of civil rights leader Jesse Jackson, has died. She was 92. Jackson described his mother as a talented musician, active member of her church and big inspiration for much of his community activism. Born in 1923, Helen Burns Jackson "lived under very trying circumstances, but she was so determined to make a contribution," her son said. Jackson said his mother had two scholarships to attend college, but when she became pregnant with him, she chose not to go. She later became a cosmetologist. "She helped a lot of people," Jackson told The Greenville News (http://grnol.co/1UxbwS6 ) a few days before she died. "That's mostly what I remember about Mother is some people would call and say 'I need my hair to be dressed, but I don't have any money.' She would say, 'Come on anyhow.'" Jackson also recalled how his mother would help others who couldn't read or write fill out government paperwork. One year when they were too poor to buy Christmas gifts, he said, they came home from a pageant to find six bags of groceries on the porch. They learned later the groceries came from an illiterate World War I veteran whom Burns Jackson had once helped. Years later, Burns Jackson watched her son rise to fame as an activist, primarily from her South Carolina home. However, she appeared onstage when he addressed the Democratic National Convention in 1988. He lost the nomination that year to Michael Dukakis. Another son, Chuck Jackson, is a singer and songwriter. Burns Jackson also listened to her son's radio broadcasts from Chicago and never missed a TV appearance, Jackson told the newspaper. "She took lots of joy in that," he said. "She always asked, 'Lord, what have I done to deserve this? What have I done to deserve this?'"